This is still dropping. So just wait for a 123 low set up to form before entering this. Simple. The trend is clearly down so you should not be buying this yet. This could have some way to fall yet potentially... Possibly taking the whole sector with it?? Last Edit: 16 Aug 2015 21:27 by Trendfriend. buy low sell high simple as that . Remember Tsco at 1.50 went back to 2.5 . Miners have been here before and jumped back just let me know where the bottom is my guess is 1.50/1.60 . thats the tricky bit! Succumbing to industry pressures, Glencore's market value has slumped by more than 40% in the last three months, and the shares continue to trade at a faction of the May 2011 IPO price of 530p. And JP Morgan reckons any rally will be short-lived, with balance sheet strains, loss-making operations and dividend concerns likely to reaffirming the downward trend. Analysts there predict Glencore's marketing business will miss expectations with just $1.1 billion of operating profit in the half. Their full-year target of $2.7 billion looks a long shot, too. Hitting that will need a 31% improvement on the first half, but second-half profit has not exceeded the first half since 210. Given Rio Tinto (RIO) and BHP Billiton's (BLT) progressive dividend policies, Glencore is being left in the shade. JP Morgan added: "At current commodity prices, we calculate GLEN is at breakeven profitability in 2016 and loss making in 2017. We expect a 13.7% spot FCF [free cash flow] yield in 2015 will benefit credit not equity holders. We lower our price target to £2.10/share and we remain 'underweight'." Yep, this really been smashed..
Redrawn the trendlines, this is going back to when the company started trading.. Even this has broken the falling support trendline!! Could be a bear trap break, must wait and see.... could well this has some way to go..
Next target looks to be 166p. But, why buy this .. now, as the comodity prices is about to crash with chinese games on currently. I am sure there may b a currency war now... also AUStralia in trouble big time. Stops below the support trendline.. This is the weekly. 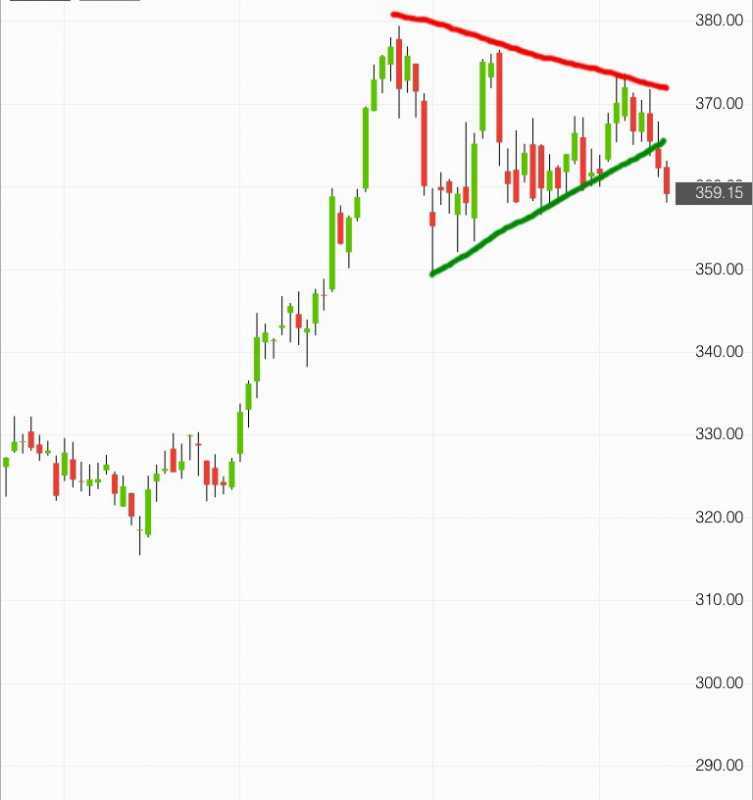 Looks like a hammer candle right on the trendline?? Close up on the daily. Was thinking exaclty the same F4T. With the markets looking on the verge of a tumble, will this move higher? I think it will, in fact some of the miners, may well be a safe haven, while the main markets have a retrace imo. I never thought i would say miners and safe haven, in the same sentence! Guess, you heard it here first. Don't have a position here ATM, i will buy a upwards breakout, if it happens. Looks like a classic bull pennant to me that generally breaks higher. Not quite in the apex yet. 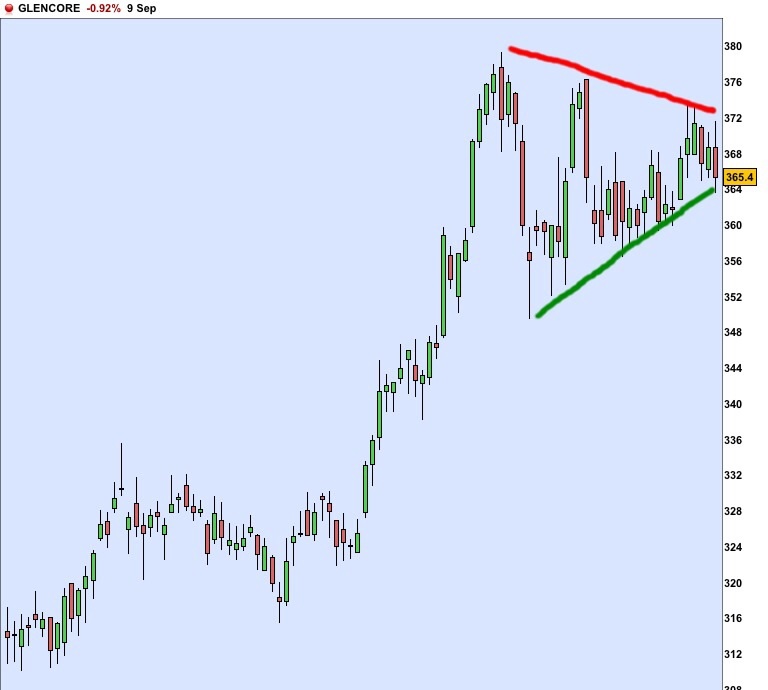 This is in a nice bull pennant formation atm. (Basically the same as a bull flag). The good thing is its getting ready for a break out imho, if it breaks up, i will go long, the breakout would be @ around 369p, (falling daily), stops below the low of the pennant @ 354p. If it breaks up, keep an eye on, and be flexible @ 377/380p, a break above and this could target a rise of the same size as the flag pole around 70p, so to 420p roughly. This is also the target at the top of the rising channel as shown here. I'm wondering where the next resistance is ? I don't know how to use Fibs for resistance but we've had highs of 400p back in sept 2012 and the start of 2013 so maybe that where it's going . Glen is doing nicely and has broken up through it's down trend ( thanks for that Remo ) but i'd like to ask about next resistance please ? diver, didn't make your 347 but did pull back as you suggested. So I guess you are still interested? I am not going to pretend I understand your chart and fibonacci numbers, but GLEN intrigues me. Short-term this should make 347 before a pull-back, maybe to 325ish,then heading north toward 400. The RSI is already pushing hard, though not quite broken-out yet. Its broken through the short term down trend line, but the main down trend line is near by. am i right in seeing that Glen has broke up through it's recent downtrend line (made from the high of 19th feb and the 6th march ? and also it's resistance of 320 of the 9th April and 320 of 30th dec 2013 ? i'm guessing next resistance could be 342 ? sorry (after all these years) i don't know how to post a chart.